With the growing season wrapped up for winter and the temperature hovering at 45 degrees on a recent Sunday, the community garden off Wedgewood Avenue looked to be draped in a brown afghan with just a few patches of green peeking through. But despite its sleepy, winter coat, an active community springs from this plot. 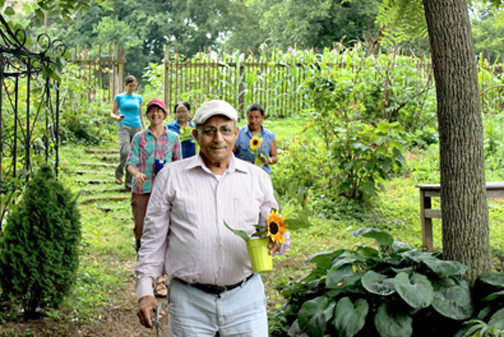 Growers take a stroll through the Wedgewood community garden. From left: Catherine Pearson, Christina Bentrup, Leela Rai, Padma Kharel and Chatur Gurung. 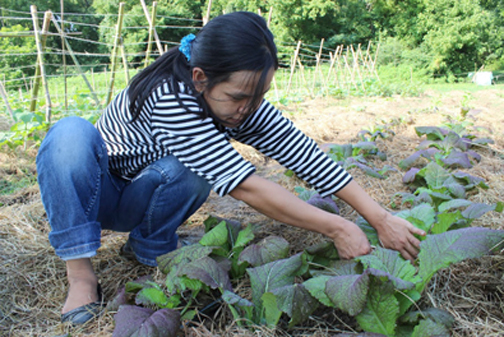 About 20 new Nashvillians from Nepal and Bhutan grew vegetables for their families here over the past year as part of the Refugee Agricultural Partnership Program. Middle Tennessee organizers of the program have been busy enrolling new participants for the coming season and will begin training sessions in January. The Wedgewood community garden and others in the program offer a different way for new Nashvillians to integrate into a city that President Obama recently chose as the backdrop for his immigration speech – a city with one of the fastest growing immigrant populations. “I want more people to be involved, so they can get the benefit from this type program,” says Siddi Rimal, a Bhutan native grower who now also works as a part-time garden manager and interpreter. He had joined several others from the Wedgewood garden for an end-of-season potluck with plates of curried vegetables spooned over rice and dumplings stuffed with cabbage. 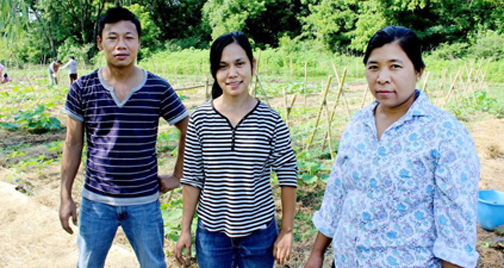 But in addition to growers at Wedgewood, a second garden at Blackman Road in Crieve Hall provides space for another 11 growers, originally from the Burma region. The gardens hold about three acres collectively and are managed through a three-year federal grant won by the Center for Refugees + Immigrants, Nashville Food Project, Nashville Grown and the Tennessee Foreign Language Institute. They also will partner with FASHA (Fervent Assistance to Survivors for Healthy Adjustment), which launched another garden this year hosting plots for growers from eight different nations including Rwanda, Congo, Burundi, Mexico, Liberia, Zimbabwe and the Philippines. At least one grower from Nepal in his 70s doesn’t have the language skills that younger immigrants might have nor does he have the job prospects. But by farming, he helps provide for his children and grandchildren while also teaching them skills to pass on to younger generations. “There are 5,000 Nepalese refugees in Nashville, and we work with 20 right now. 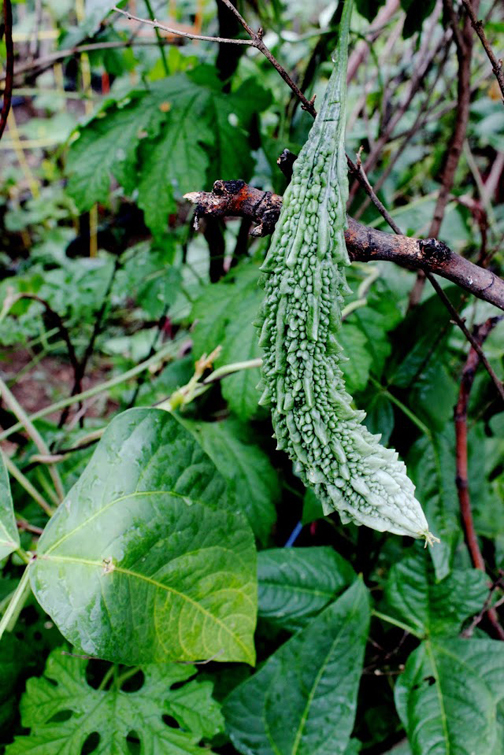 For the other 4,980 to have access to their traditional foods and not feel like their whole history is invalid, and to be able to have bitter gourd (a vegetable native to Nepal being grown in Nashville) is huge,” says Christina Bentrup, who also works as garden manager for the Nashville Food Project. Elizabeth (Lu Lu) Nhkum harvests crops from the Blackman Road Garden. As both Mayor Karl Dean and President Obama noted this month, immigrants often play a part in starting food-related businesses and adding to diversity. Garden organizers also believe they can lend farming experience and a variety of crops like bitter gourds, peppers and vegetable marrow as we learn from one another. La Ring Shun, Elizabeth (Lu Lu Nhkum) and Ma Ree Yar take a break at the Blackman Road Garden. But even with experience, it’s no secret that farming is hard work with barriers including access to appropriate land and equipment without the added challenges of language, cultural and climate differences and transportation woes. The Wedgewood garden is located farther from where many of the gardeners live, so as the program begins, Bailey and Bentrup meet participants in their neighborhoods and ride a Metro bus with them until they felt comfortable making the trek on their own. Now on their own, the gardeners show up despite working full-time jobs and night shifts sleeping only an hour or two before working the land. “When people are harvesting, and I see the amount they are taking home, I’m like this is working. They’re getting food that they’ve grown themselves,” Bailey notes, adding that many no longer visit the grocery for produce. Beatrice Gatebuke, a refugee from Rwanda, was among the few in the room at Casa Azafran community center when President Obama spoke about his immigration plan. She started planning her FASHA garden with her sister, Alice, in 2012 and held their groundbreaking event in May 2014. Bitter gourd, though not indigenous to Tennessee, grows well here and produces a bitter-tasting fruit popular among Wedgewood community growers. The sisters struggled in the beginning with access to water on repurposed Metro flood plain land. The Blackman garden and FASHA gardens both use Metro flood plain land, which presents its own set of challenges such as rules against structures for storing tools or fences. The Gatabukes overcame their water struggle with the help of Metro Human Relations Commission. “Community gardens literally create a common ground,” explains Mark Eatherly of Metro Human Relations. “The people coming to the garden might have vastly different backgrounds. Talking about what they are growing, sharing recipes, and helping each other plant and weed their gardens, are just some of the ways that folks are able to really connect without pretense or structure. The long-term vision for the program will give immigrants and refugees the skills, access and tools to start their own farms or business in self-sufficiency beyond the program as it continues to enroll new members. But the three-year grant for the Refugee Agricultural Partnership Program will end in 2016, and they will need to continue raising funds to add to that seed money. Bentrup and Bailey can keep track of produce yields and can help tailor future training to those who want to sell produce or start small businesses. But to measure the more intangible social and emotional benefits of the program, they worked with a volunteer from Vanderbilt University graduate student to conduct focus groups with participants at the end of this growing season. After the meeting, Bentrup and Bailey joined the group for a potluck lunch.